As information comes out regarding the missing Malaysia Flight 370, more questions are surfacing, specifically about the lack of connecting the dots on the part of the mainstream media. Why are they not reporting everything? Are they once again holding back information from the general public at the request of Washington? Why is the Alternative Media having to do the heavy lifting, forcing the MSM to finally report the news, only after it is public knowledge? From the start something has been “off” with the way this missing flight 370 was reported on, then to find out cell phones of the missing were ringing through, the transponders being turned off deliberately, the flight continued on for far longer than originally reported, no wreckage found, searched being conducted in the complete wrong area, the passengers being DoD employees who just happened to be working on technology that could have included “cloaking” and vanishing objects, and a whole host of other anomalies. 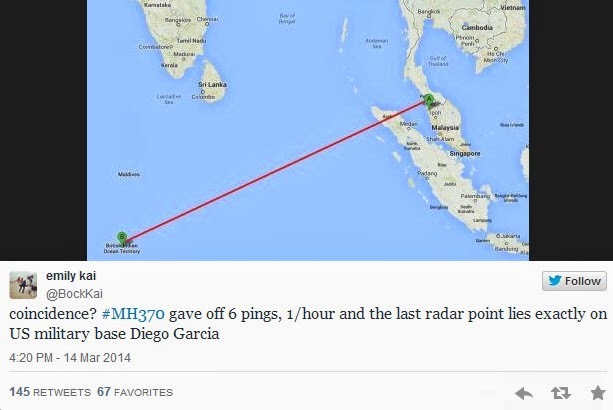 While the MSM attempts to ignore the ramifications of the last radar ping from the missing Malaysia Flight 370 being exactly on the US military base Diego Garcia, folks at #MH370 via Twitter, are not. The newly released information goes hand-in-hand with the words of Retired Lt. Gen. Tom McInerney, who served as a pilot, commander and strategic planner in the U.S. Air Force when he asserts the U.S. government “knows a lot more” than it is publicly revealing about the Maylasian jetliner.